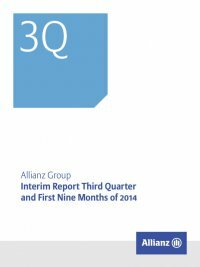 108 Interim Report Third Quarter and First Nine Months of 2014 Allianz Group Fair Value Measurement on a non-recurring basis Certainfinancialassetsaremeasuredatfairvalueonanon-recurring basis when events or changes in circumstances indicate that the carrying amount may not be recoverable. If financial assets are measured at fair value on a non-recurring basis at the time of impairment, corresponding disclosures can be found in note 32 – Impairments of investments (net). If fair value less cost to sell is used as the measurement basis under IFRS 5, corre- sponding disclosures can be found in note 11 – Non-current assets and assets and liabilities of disposal groups classified as held for sale. Reclassification of financial assets On 31 January 2009, certain USD-denominated CDOs were reclassified from financial assets held for trading to loans and advances to banks and customers in accordance with IAS 39. As of 31 December 2013, the carrying amount and fair value of the CDOs was € 166 MN and € 156 MN, respectively. As of 30 September 2014, the carrying amount and fair value of the CDOs was € 162 MN and € 158 MN, respectively. For the nine months ended 30 September 2014, the net profit related to the CDOs was not significant. 39 – Earnings per share Basic earnings per share Basic earnings per share are calculated by dividing net income attrib- utable to shareholders by the weighted average number of common shares outstanding for the period. basic earnings per share € mn three months ended 30 September nine months ended 30 September 2014 2013 2014 2013 Net income attributable to shareholders used to calculate basic earnings per share 1,606 1,445 5,002 4,740 Weighted average number of common shares outstanding 453,784,317 453,216,918 453,762,049 453,196,597 Basic earnings per share (€) 3.54 3.19 11.02 10.46 Diluted earnings per share Diluted earnings per share are calculated by dividing net income attributable to shareholders by the weighted average number of com- mon shares outstanding for the period, both adjusted for the effects of potentially dilutive common shares. Potentially dilutive common shares arise from various share-based compensation plans of the ­Allianz Group. The dilution effect for the three and the nine months ended 30 September 2014 amounted to € 0.02 (2013: € 0.05) and € 0.07 (2013: € 0.13) per share.